The change curve exists to help us understand how people emotionally experience a major disruptive change. Without change an organization will cease to exist as products become obsolete, consumer taste moves on, and even political regimes change as popular opinion and views change. Thus, every organization must change if it is to continue to grow and be successful. From a people perspective, implementing change can be very challenging. Why? Because people are used to their routines. They are used to the status-quo. An impending major change can feel threatening. People may fear that their previous work is being undermined or devalued, or worse, they may fear that they will lose their job. 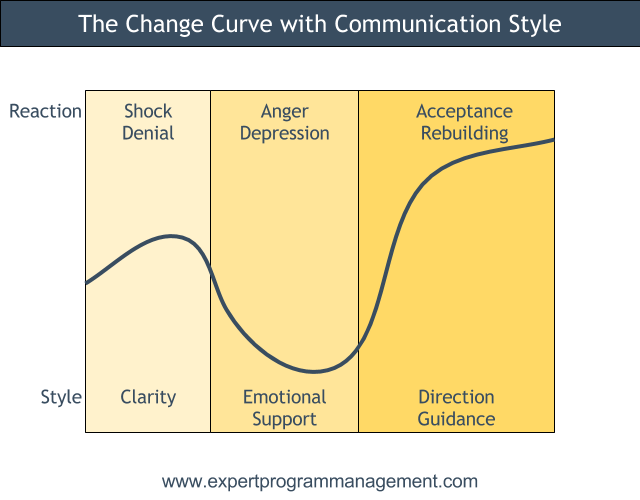 As a manager it is useful to understand the Kubler-Ross Change Curve (also known as the 5 Stages of Grief or grief curve), because it can help us help our team members to more quickly accept, and even embrace, change. If you don’t want to read the entire article, take a look at the video below we’ve put together. The original grief curve describes how people handle grief when confronted with terminal illness. As they were originally described the 5 stages of grief are are given below. Alongside each stage you can see the thoughts associated with that stage. Denial: “I feel fine. This can’t be happening to me”. Depression: “I’m going to die so what is the point!”. Acceptance: “I can’t fight it, so I may as well prepare for it”. Shock: The initial shock on hearing the announcement. Denial: The belief that the change isn’t relevant to them or their work. Frustration: They will block this change; they are not going to allow this to happen! Depression: Everything they are currently doing seems pointless, and their confidence may falter. Experimentation: People start to question if this might just work for them? They begin to try things out and consider scenarios. Basically, they have accepted that the change is going to happen and there is nothing they can do about it. Decisions: Finally they are coming to terms with what is happening and starting to feel more positive about the future. They are making decisions about what works and what doesn’t work. Integration: What was once new is now starting to be just the way things are done. As we follow the curve from left to right, we can see that people’s initial reaction to an upcoming major change is to feel shocked, but ultimately carry on as though the change isn’t going to happen. Then they start to feel angry and annoyed and will look to fight the change, and for someone to blame for the misfortune that’s been placed at their door. At this point their work will start to suffer as they cannot see the point of continuing to work hard if everything is going to change soon anyway. As you can imagine, this is a very unpleasant stage for people affected by the change. As time goes on, productivity drops further as anger gives way to depression, but it is always darkest just before dawn, and this phase is also associated with people beginning to accept that the change is happening. Basically, people finally start to let go of what was, and start to accept what is. 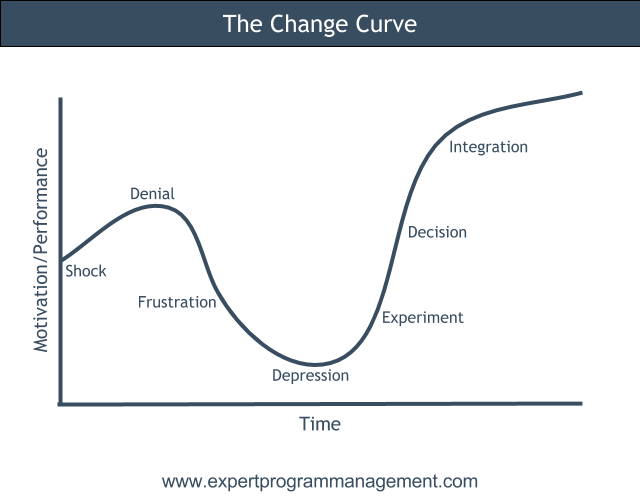 In the final phases of the change curve people start to embrace the change. This happens slowly at first, with people starting to explore ideas of how things might look and work after the change. Finally, each individual makes a decision to fully embrace the change, reorganise their ways of working, and integrating with the new change. It is only at this point that the organisation can start to experience the benefits of the change. Note: there are lots of different variations of the change curve, each using different labels for the different points along the curve. But ultimately, each alternative change curve follows the same path along the same curve even if the labels are different. By understanding the organizational change curve and changing your approach based on the stage people are at, it will make it easier for you to support your people through major organizational change. This in turn will increase the likelihood of the change being successful. As a manager, understanding the change curve can put us at an advantage when managing change, because by understanding the organizational change curve we can aim to accelerate the speed at which people move along the curve, and reducing the depth of depression people experience during the change. But how do you achieve this accelerated and smother change? The answer is through communication. As you can see, during the initial phases of the change curve you should focus on clear and timely communication to all those affected. Any mismanagement of communication now will require extra work later to put right, so why not get it right first time? You should aim to ensure your communications are clear yet complete, along with being honest, and including all those affected. As we transition along the change curve and some people begin to feel angry about the change, make sure you take the lead and actively let people know that your door is always open and that you will listen sympathetically to their issues and reassure them as much as possible. In offering emotional support during this phase of the curve your aim is to minimise the amount of time spent in the depressed bottom phase of the curve. Finally, as we transition towards generating ideas and the realisation that this might just work as a solution for them, your focus should be on supporting and guiding them, as they explore the possibilities and make decisions on how the change will work for them. Effectively you switch from offering them emotional support towards pointing out opportunities and facilitation of meetings to work out how things will look after the change. 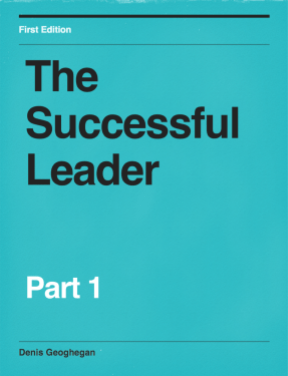 By managing the change carefully through how we communicate we can achieve a far better outcome than if we allowed the change to impact our team in an unmanaged way. The organizational change curve provides a general rule of thumb as to how people emotionally handle change. It was first used to model how people come to terms with terminal illness. 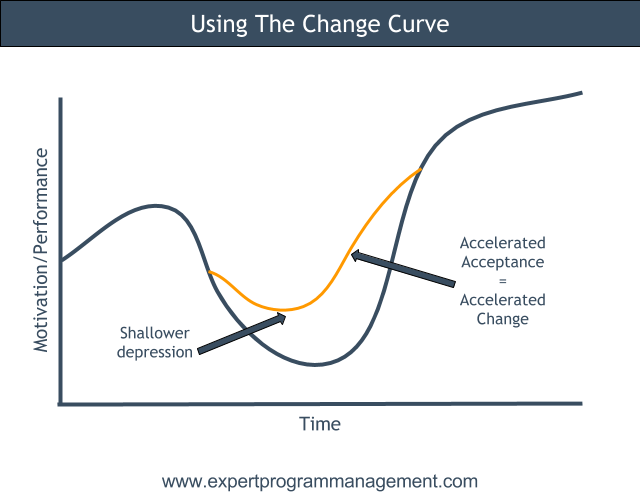 Knowledge of the change curve can help us as managers improve how we interact with those undergoing change, ultimately making the change achieve success more quickly and decreasing the duress on our team. Finally, for those of you who love classical music, why not check out this analogous comparison between a Mozart string quartet and the organizational change curve.